Breakfast is included for all guests! The Exford Hotel is a heritage style building, built in 1854. 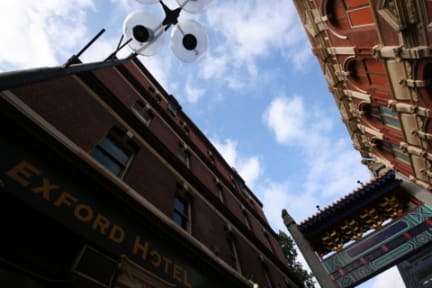 Located in Chinatown in the heart of the city. We offer dormitory style rooms as well as twin and doubles. The reception is open 24hrs with secure access to the hostel and a relaxed come and go as you please feel. Facilities include internet access with WiFi throughout the building. We have a TV room with Foxtel and free movie hire, a huge kitchen with walk in fridge and secure lockers for food storage. We also offer our guests free breakfast. 10.30am check out. Tour bookings and an on site bottleshop thats open until 3.00am. On the ground floor is one of Melbourne's oldest pubs with its stained glassed windows and ornate pressed metal ceilings. Free pool on Sundays and discount drinks for guests. Best of all its open until at least 4.00am every night. On the 1st floor is the Winter Garden room an elegantly designed lounge bar that hosts a variety of nights. Come on down and enjoy a pizza and a pot of beer and sample a true Australian pub. All rooms have been recently repainted with new carpet throughout the common areas. All beds have inner spring mattresses and rooms are cleaned daily. Well,I booked wrong date,I was going to check in on 12-14,but for somehow I booked on 10-12,so I missed the check in,well it’s comepletly my fault.